15th-century Italian blind-tooled brown leather over heavy boards. Erased late 15th-century ex-libris of Lorenzo and Giovanni di Pierfrancesco de' Medici on fol. 102; Archibald Acheson, 3rd Lord Gosford (paid £6.6.0 in 1841 and signature on fol. 1); his library purchased by James Toovey in 1878, catalogue, 1901, p. 192; purchased by J. Pierpont Morgan (1837-1913) with the Toovey Collection in 1899; J.P. Morgan (1867-1943). 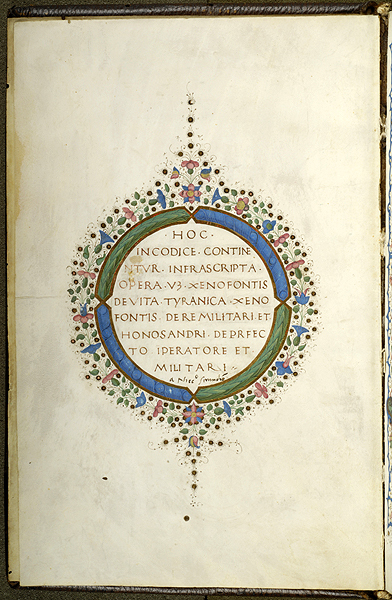 Ms; written and illuminated in Florence, Italy, ca. 1470. Texts: Xenophon: De vita tirannica (fol. 3v-22); De re militari (fol. 24-44); Onasander: De perfecto imperatore et re militari (fol. 48-99v). Xenophon translated by Leonardo Bruni; Onasander translated by Niccolò Sagundino (Nikolaos Sekoundinos). Scribe: Gundisalvus hispanus (Gundisalvus Fernandez de Heredia, d. 1511); signed on fol. 99v. Decoration: title in gold within an elaborately decorated circular frame, 1 full four-sided border of bianchi girari inset with medallions, putti, and birds. Artist: Mariano, del Buono di Jacopo (1433-1504).